« What a difference three months make, part B. And saving the Arctic through art. Today’s post features just a single image–well, two views of a single image–which I captured while wandering the streets of Bushwick, which has become one of the hippest neighborhoods in the hippest borough of New York City. Indeed, the streets of 2016 Bushwick were a stark contrast to the Bushwick I first encountered in 1995, when I was offered a small, ground-floor studio apartment. Had you told me then, when I paid for my soda and chips through a plexi-glass partition at the bodega that these same streets would one day be home to gastropub-cinemas and sidewalk cafés offering fair trade lattés and vegan pastries, I would have spit my Mountain Dew all over the potholed street. 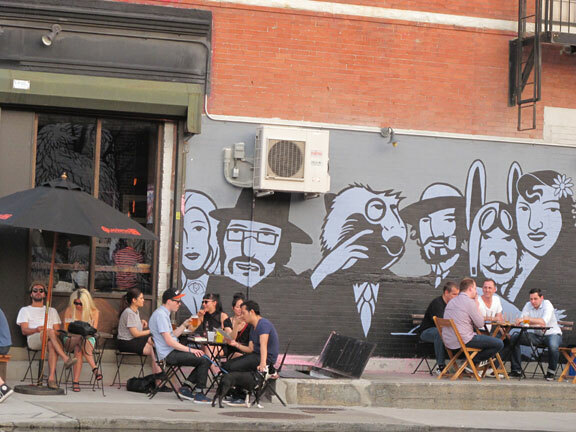 Bushwick has also become well-known as a haven for some fantastic street art, which will be featured in a future post. Today’s image is a pasteup of a young boy with his hands up, and below him the caption “don’t shoot”. It seems to be a reference to the phrase “hands up, don’t shoot”, which has become the mantra of many protests by groups such as the Black Lives Matter movement. It is perhaps for this reason it quickly became the first photo ever on my Instagram feed to reach 100 likes. I consider this quite a milestone, as I’ve had the Instagram account for around the same amount of time as I’ve been keeping this blog, for just over 4 years. Speaking of my instagram account, it’s a great place to check out some of the street shots that didn’t make it on to the blog, along with other non-street art related images I find along the way. My instagram name is @tbri001. Be sure to check it out!